Indian media’s dislike for Arnab Goswami, Times Now’s thundering Editor, is well known. There have been many subtle media campaigns by channels like NDTV and CNN-IBN (sense over sensationalism) trying to counter Arnab’s style of vociferous, over the top news anchoring. The reason till now was simple: Arnab just got much better TRPs. Much, much better. A colonial law like sedition needs to be struck off statute books. Prosecute for violence, not for sloganeering IMHO. But Arnab went the other way. Every day his panel discussion was about trashing all such arguments in favour of the slogans like “Bharat Ki Barbaadi” and “Bharat tere tukde honge”. His video which slammed Umar Khalid and gang has been viral on social media for days. Why did he do it? Arnab Goswami is a hard character to judge. Is he a BJP supporter? Not if you see his relentless tirade (perhaps the strongest) against Sushma Swaraj during the Lalit Modi issue. Is he a “Right-Winger” who is not necessarily with BJP, but more with the cause? His debates questioning the practices of barring women in Hindu temples ought to suggest he is not. Is he then a “Nationalist”, for taking up a pro-India stance in every debate which gives him a chance to do so? (for example, every debate with Pakistan on the other side). Probably. One might very well argue that he is just TRP hungry and hence he chooses to be a “nationalist”, and to an extent that might be true. But studying his stances across debates, no one can say he is not a “nationalist”. My nationalism is made of stronger stuff than the bile of 8 talking heads & one screaming anchor.Sick of dogmas, binaries & banalities. The likes of Barkha were shocked. They suddenly realised how Arnab had beaten them completely. What the TRP ratings had been saying for long, was now much more visible. And this was caused them to raise the pitch against Arnab. Soon, came the utterly shameful alleged attack on journalists by the Patiala court lawyers and a BJP MLA O P Sharma. Violence against anyone can never be excused, even less so by lawmakers and law practitioners. The left liberal media was deeply uncomfortable in holding these debates over the JNU issue because they couldn’t openly slam JNU and yet they couldn’t back them fully either. These lawless lawyers provided the perfect escape route for this section of the media. Once the incident at Patiala played out, the narrative in these channels changed from JNU sloganeering to Lawless lawyers and attack on media. So 2 news channels boycott protests by journalists against attacks on fellow journalists. Time to name/shame them? And now, thanks to all the above escalations, things have reached to a hilarious situation where Leftist rags are suggesting people should Boycott Arnab. Of course, till a few months back boycotts were “communal” (read Boycott Dilwale). And guess who were using this hashtag? “Bhakts”, or right-wingers, who have abused Arnab in the past (and will surely abuse in the future too). 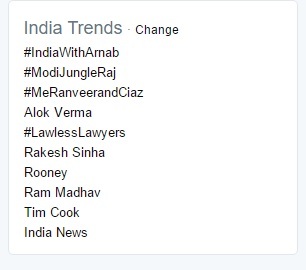 In fact, even as they were trending this hashtag, Arnab was reportedly bashing BJP. So what explains this? Arnab is with India, hence India is with Arnab stupid! As I had said in a tweet earlier, the “Bhakti” of the “Bhakts” lies with India and whoever/whatever they perceive, at that moment, to be beneficial to India. And Arnab fits that criteria. He may go anti-BJP, anti-Hinduism, anti-Right Wing very soon, but the so called “Bhakts” will support him when he takes up the cause of the nation. What should the Left Liberal media draw out of this entire episode? They have lost the pulse of the nation completely. This is reflected in multiple interactions but they just refuse to see this. Their TRPs are falling, their twitter mentions are almost always filled by abuse. Now they are getting abused by lawyers in person! Abuse is wrong (although it is covered under Freedom of Expression), but the Leftist media-persons need to introspect why are they facing this blowback. Talk to any average India, see your WhatsApp groups, most people are incensed about the anti-national slogans in JNU. On the other hand the likes of Rajdeep and Barkha have tried their best to defend the accused. And the public also knows that these defences are not from their love for free speech. Sagarika has openly batted for restrictions on free speech in the past, Barkha has sued bloggers. Most glaringly, these so called crusaders of free speech were silent when Kamlesh Tiwari was arrested and charged with NSA. These are just positions taken by these star anchors to suit their ideological biases. And now, the average Indian is slowly waking upto this. Arnab Goswami may still be a “nationalist” by convenience, convenience which high TRPs afford him, and that mask is yet to fall, but the masks have fallen off the likes of Rajdeep and Barkha. Kanhaiya Kumar was gheraod by Begusarai locals and questioned about the 'Bharat tere tukde honge' slogans that were raised by him and his opposition to reservation for the economically backward sections of the society. TISS student group expressed 'solidarity' with the Student Action Committee that was evidently spearheading a campaign against the provision for awarding 'Gold medal', 'Silver medal', 'Best Student' and 'Best Dissertation Award'.